Singer Home Furniture offers you to complete your Kitchen with modern Kitchen units from the special price of Rs. 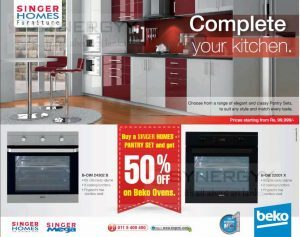 99,999/- upwards, buy Singer Homes Pantry set and get 50% off on Beko ovens. 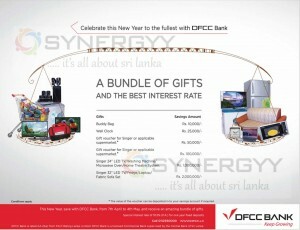 DFCC announces a special gift for your money deposits between 7th April to 4th May 2016 for this Sinhala Tamil New Year festive. 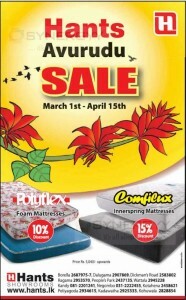 The promotion is brings you many gifts for your every saving amount from Rs. 10,000/- upwards. Rs. 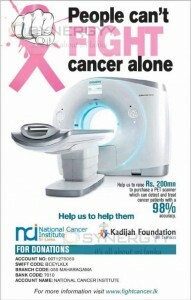 1,000,000/- Singer 24″ LED TV/Washing Machine/Microwave Oven/Home Theatre System. 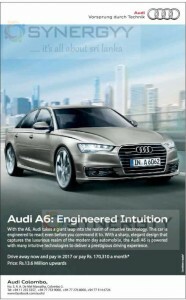 Audi Colombo Announced proudly introduces Audi A6 Model to Sri lanka; Audi takes a giant leap into the realm of intuitive technology. 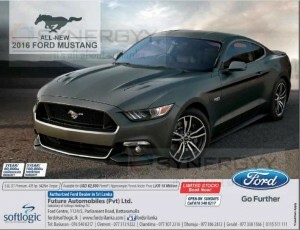 This car is engineered to react even before you command it to. With a sharp, elegant design that captures the luxurious realm of the modern day automobile, the Audi A6 is powered with many intuitive technologies to deliver a prestigious driving experience. No. 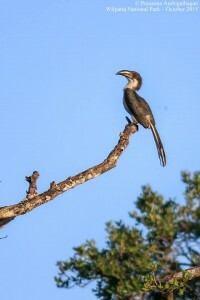 3, R. A. 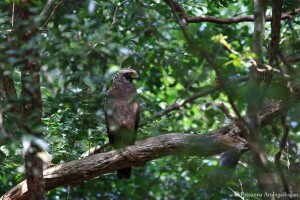 De Mel Mawatha, Colombo 5. 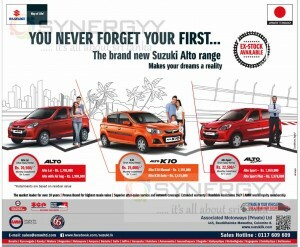 Suzuki Alto is one of the highest selling car in Sri Lanka also Suzuki Alto name it highest resale value car in Sri Lanka as well, because it is very affordable price Indian Manufacture using Japan Technology. For more detail see below image or contact to Associated Motorways (Private) Ltd, No. 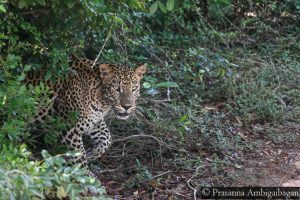 445, Bauddhaloka Mawatha, Colombo 8. 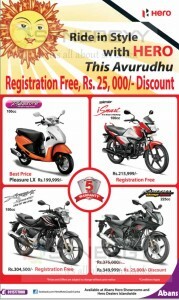 Abans announces a special promotion for this Sinhala Tamil New Year promotion for Hero Motor Bikes, the promotion brings you Free registration / Discounts upto 25,000/- on your new Hero Motor cycles in this New Year. 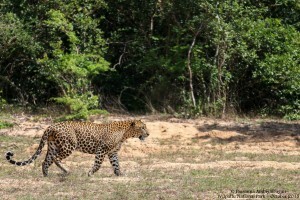 Are you looking forward a enjoyable and comfortable stay at main tourist location of Sri Lanka at budget rate; here is a best option for you, stay at Automobile Association Bungalows located in main tourist attraction areas are now available for your holiday season at a special price. 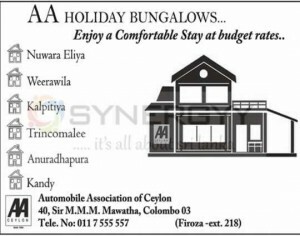 If you plan to visit Tourist holiday spots of Nuwara Eliya, Weerawila, Kalpitiya, Trincomalee, Anuradhapura or Kandy in your weekends or holiday seasons, call Automobile Association on 011 7 555 557 and book Automobile Association Bungalows at a very special price. 40, Sir M.M.M. 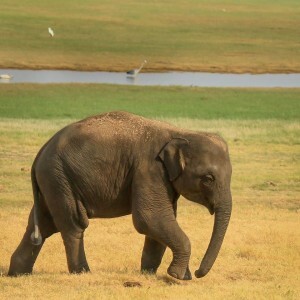 Mawatha, Colombo 03. Singer Sri Lanka announces a special festive promotion for Samsung 32” Smart TV for Rs. 52,990/-. Samsung 32” Smart TV comes with the latest technology of internet browsing on your Tv using wifi Connectivity or HDMI connection with your mobile or laptops. 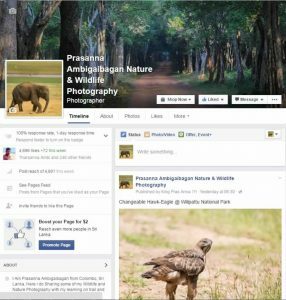 now its more convenience for you to see Youtube videos, Facebook updates and Twitter and many more. 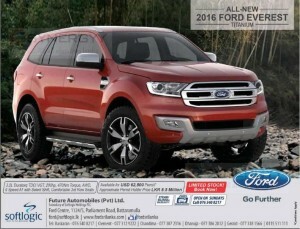 Ford Everest Titanium 2016 is a 3.2L Duratorq TDCi VGT engine with 200hp, 470Nm Torque, AWD, 6 Speed Auto transmissions with Select Shift. Comfortable 3rd Row Seats. Seylan Bank and KFC announces a special Promotion for the Seylan Bank Creditcard, use your Seylan Bank credit card at any KFC outlet on 5th,12th,19thand 26th April 2016 and enjoy Buy One Get One Free Promotion for below items. SMS ‘YES’ SPACE <your NIC number, to 011 200 88 88 to got your hands on a Seylan Credit Card today. 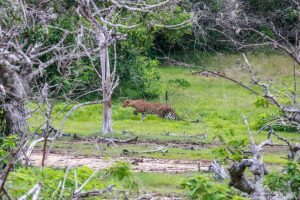 World Duty Free Shop located in Departure and Arrival launch of Bandaranayke International Airport announces a special promotion for this Sinhala Tamil New Year celebrating Travelers as below. 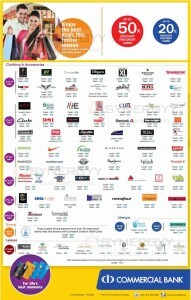 And many more instant offers are available, for more details see below image or visit to World Duty Free on your travels. 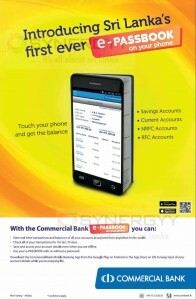 Commercial Bank introduces a new Conceptual Electronic passbook with the name of e-Passbook. With the e-Passbook you can view real time transactions and balances of all your accounts at anytime from anywhere in the world, check all of your transactions for the last 30 days and in addition to that you can use your e-PASSBOOK with or without a password. Now e-Passbook available for Savings Accounts, Current Accounts, NRFC Accounts, RFC Accounts. Download the Commercial Bank Mobile Banking App from the Google Play on Android or the App Store on iOS to keep track of your account details while you’re enjoying life. Commercial Bank PLC offers highest interest rate for fixed deposits (terms Deposits) compare to other companies in Banking Industry. Below fixed Deposits Interest rates are Updated as today. 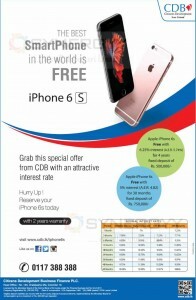 Citizen Development Business Finance PLC announces a special promotion for 30 Months and 4 years Fixed Deposits to get a nominal interest rate along with Apple iPhone 6S Free. Make a Fixed Deposits of Rs. 500,000/- for 4years at a 6.25% Interest rate (A.E.R. 5.74%) and get your Apple iPhone 6S Free. 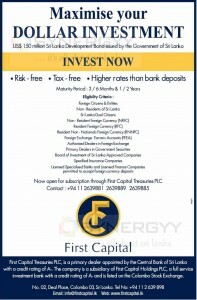 Normal 4 Years Fixed Deposit Interest rate would be 11.50% (A.E.R 9.92% ). 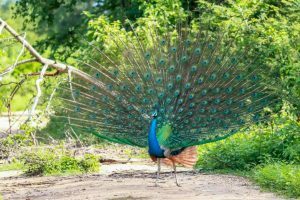 Or els make a Fixed Deposits of Rs. 750,000/- for 30 Months at a 5% Interest rate (A.E.R. 4.82%) and get your Apple iPhone 6S Free. Normal 36 Month Fixed Deposit Interest rate would be 11% (A.E.R 9.97% ). If you really wanted to buy an Apple iPhone this may be good promotion, but as an investment opportunity this promotion will not work. 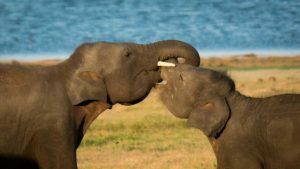 When you travel well, your trip can become more memorable, more meaningful, more rewarding. Fly daily non-stop from Colombo to Hong Kong and onwards to over 190 destinations worldwide* More choice, no hassles. That’s travelling well. 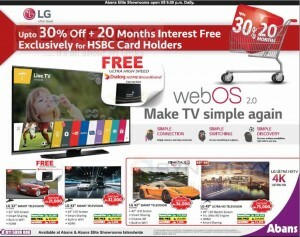 Abans announces a special 30% off and 20 month interest free installment scheme available for any LG TV Purchases by HSBC Credit cards. 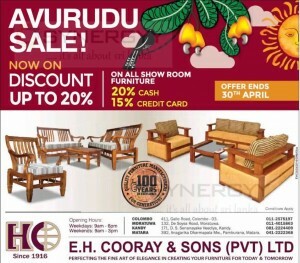 E H Cooray & Sons is a leading furniture designers in Sri Lanka announces their special promotion for the Sinhala/Tamil New Year seasonal sale. 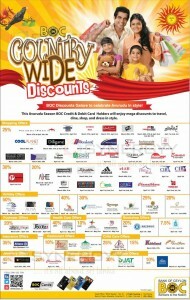 Enjoy special 20% discount on Cash purchases and 15% discount on Credit card purchases. The offer is only valid to all showroom furniture and its valid upto 30th April 2016. 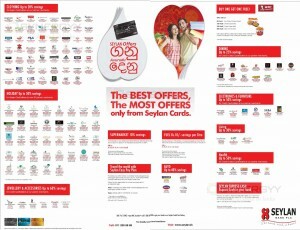 Seylan Bank announces biggest credit card discounts and promotion for the Sinhala Tamil New Year festive month of April 2016. This special promotion is exclusively valid for Seylan Bank Credit Card from range of Clothing, Holiday, Jeweler & Accessories, Supermarket, overseas travel, Fuel, Auto, Dining, Electronics and Furniture, Living and Health merchants. 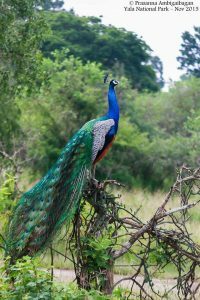 Aitken Spence Travels bring you a special Holiday tour for this April Holiday season, enjoy this special tour to Chennai with 3 Nights accommodation at a special Price of Rs. 36,500/-* upwards. The special price achieves because of the Exclusive offer given by Mihin Lanka Air line and Turyaa Chennai offers a special price for Aitken Spence hotel. 3 nights accommodation at Turyaa Chennai (5 star) on twin sharing basis with Breakfast (free 3rd night – valid for one month) | Economy class air ticket including all taxes on Mihin Lanka and Complementary return airport transfer will provide.